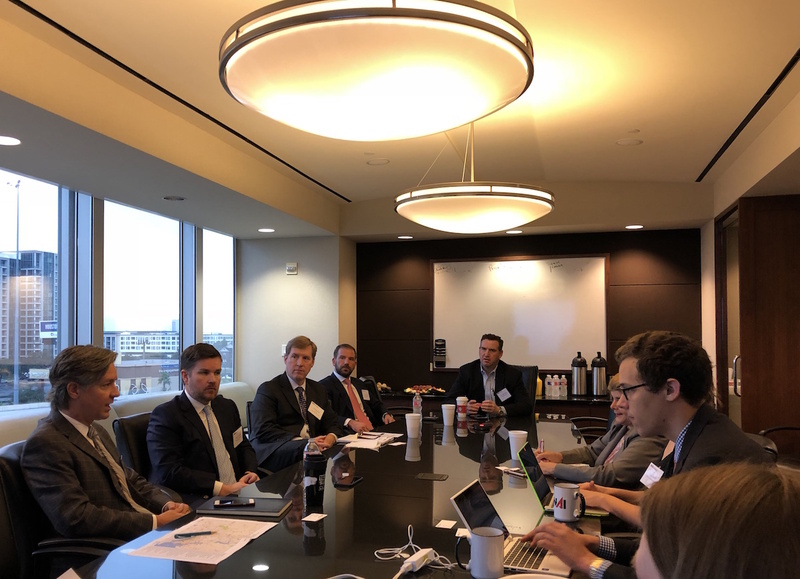 NAI Partners’ Holden Rushing (left), Jason Gaines, Griff Bandy, Andrew Pappas and Jon Silberman address the Houston media. HOUSTON – (By Michelle Leigh Smith, Realty News Report) – As the retail game goes, the trend toward nesting at home will make for a most interesting holiday shopping season. The evolution of retail was one of the key topics covered at the NAI Partners Press Event in Houston earlier this week. Retail: Jason Gaines: “More than half the country is below 40 and people have changed the way they consume food, media, everything,” says Gaines, NAI Partners Senior Vice President and Team Leader for Retail. Gaines delivered his observations at the NAI Partners press briefing earlier this week. “People are thinking more about time. I spoke with a boutique box movie theatre client who has not yet entered the Houston market and they are seeing a different approach as to how to put food and beverages into the mix. Nationally, some are doing this better than others. People are going to more home streaming. Eating out has tailed off and people are cooking at home. The trend is to eating in. I see my co-workers having lunch delivered or juicing. He expects to see more grocers adopt the two-story model that has worked for H-E-B in San Antonio and will soon be introduced in Bellaire. If H-E-B goes into Meyerland Plaza as expected, that will also be a two-level build-out. Meyerland developer Fidelis Realty awaits a green light from HEB communications before a formal announcement may be made, he said. Gaines does see e-commerce as a driver in the changing nature of retail. According to the U.S. Department of Commerce, e-commerce sales on a national level reached about $395 billion in 2016, which is a 15.6% year-over-year increase from 2015. This sharp growth in ecommerce has triggered retailers to place more importance on the transportation of merchandise from a distribution hub to their ending destination, such as Amazon Prime’s two-hour delivery, while retailers like Walmart and Target are working hard to keep up with the competition. Austin: Dan Boyles: In NAI’s Austin office under Partner Dan Boyle’s leadership, leasing activity increased. Around 1.1 million SF is under construction in the Austin industrial market now, with a large percentage of that space available for lease. The Southeast submarket, with its improved infrastructure, proximity to the airport and accessibility to San Antonio and Houston, has had the most warehouse/distribution space delivered with 713,670 SF during 2017. Veggie Noodle Company is almost ready to start shelling out organic vegetables from their converted computer-chip plant in East Austin, to a new 41,000 SF factory. The local buzz reveals that it is the second-largest food manufacturing facility in Central Texas after Michael Angelo’s Inc.’s frozen Italian food factory in North Austin. The Austin economy grew at a modest pace in August. The seasonally adjusted area unemployment rate for August was 3.1%, up from 3.0% in July. The construction sector led overall job growth, while manufacturing continued to accelerate despite weakness in computer and electronics production employment. Investment: Andrew Pappas: NAI Partners’ Fund II is well underway, with a group of high net worth investors, some with whom NAI has decades old relationships. “Our fund platform is tailored for high net worth individuals seeking to invest in real estate alongside a full service real estate firm,” says Andrew Pappas, Senior Vice President of the NAI Investment Fund. Leasing: Jon Silberman: As far as office leasing, Managing Partner Jon Silberman sees the story as a tale of two camps – those who want to office near their homes and working, living, playing in the same area and those who commute to say an energy corridor. Silberman’s strengths are his analytical background coupled with a creative problem-solving approach. Rather than the typical “it can’t be done,” Jon’s approach is “it can be done” and he finds creative solutions.